Radegast strode through the ashes. A cloud hung in his wake as he made his way to the top of the rise. Scars marred his armor, and his sidearm lay in the dust. He didn't need it, now. The battle was over. This had been a mining outpost, once. A few buildings and a transport. Nestled amid a small forest, it had been like a precious jewel set atop the dull crown of the wildlands. Now there was almost nothing left. The warrior began to walk slowly down into the valley. He pulled his helm from his head and let it drop with a muted thud into the ash. Of the forest, only stumps remained. Of the small village there was no trace; the buildings reduced to splinters. Here and there you could see dull gray signs of inhabitation. At the bottom of the valley, Radegast came to the source of the ash, death, and violence. The Light-bearers were laid out in a row, simple cloth covering their armored and robed forms. There were five of them, and they had been lined up beneath the melted girders of the settlement's great hall. These warlords had terrorized this part of the wilds for years. Hundreds had died at their hands. Radegast turned as his companions crossed the valley floor to join him. They had been policing the dead, finding a fitting end for the settlers and miners of the outpost. Jolder came with a steady glide, energy and fire. Saladin, calm and slow, the weight of the dead on his shoulders. In formation behind them stepped Perun, her boots barely leaving a trace as she walked. They gathered before him. "Never again." He intoned the words quietly. The others stood as battle-scarred statues. "We ride against despots and warlords. We hide in these enclaves, hoping that other Light-bearers will not find us. We fear each other." He shook his head, his fists clenched. "And we should not. We are stronger, together. We are mighty, together. All we have to fear is... this." He pointed down at the dead warlords. "Giving in. Allowing the power of the Light to blind us to what we truly are." It was Perun, of course, who asked the question. "What are we?" No judgment. No reproach. Still, Radegast could feel their doubt. He turned upwards, and his eyes settled on the massive span that supported the hall. His eyes shone as he turned back to his fellows. "We will be what the people need us to be. We will be guardians. We will be protectors. We will hold the last of us together." His voice rang out across the still valley. "Our days of hiding are ended. Say it now, each of you. Who among the other bearers do you trust? Who can be counted on to ride with us?" 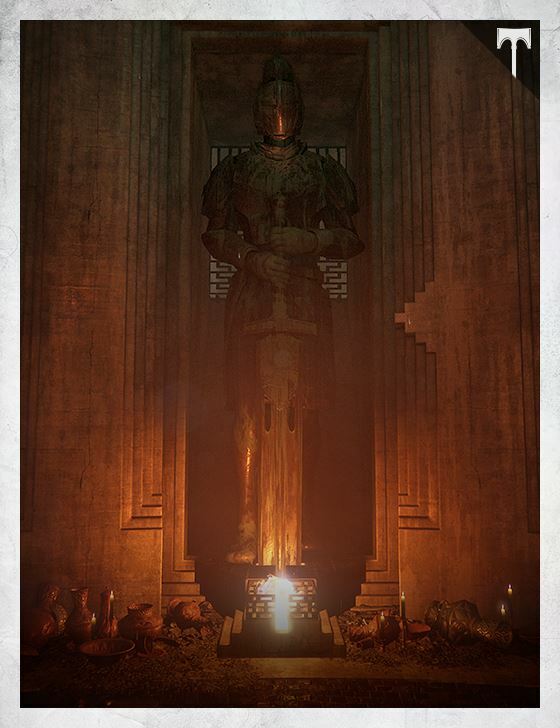 "I trust only you, Radegast," said Saladin, and their leader scowled in response. "What are you saying? What are we?" Perun asked again. Radegast smiled. "We will gather those you trust. We will not wait for this"—he gestured around him— "to force our hand. We will ride against those that would use the Light against our own. Humanity must have protectors. Like the knights of old." Around them, the dust swirled in the air. Shafts of sunlight coalesced in long slanted bars as the sun dipped towards the horizon. "Are you with me? Will you stand with me— as Iron Lords?" In the waning light, their answers rang like thunder on the air.